As you head out of Jr line Shinjuku Station West exit you will see Kotakibashi street. 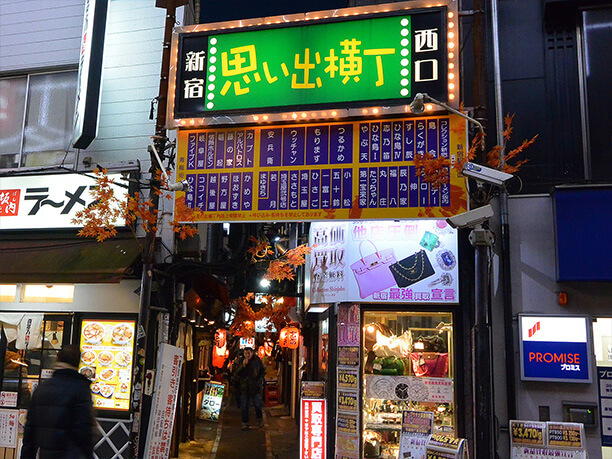 Turn left at the first intersection and you will come to the Shinjuku area’s Omoide Yokocho(新宿思い出横丁). You will recognize it by all the taverns and a Showa era atmosphere. 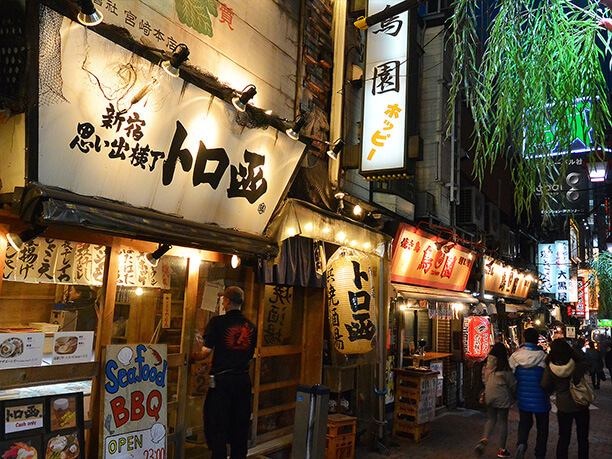 There are many shops along the street that sell yakitori chicken and motsu ya ki. They mostly use cattle, pigs and chicken that were originally raised by the occupation forces after the war. Today the number of taverns, soba and sushi restaurants, and ticket shops continue to grow, There are more than 80 stores in all. 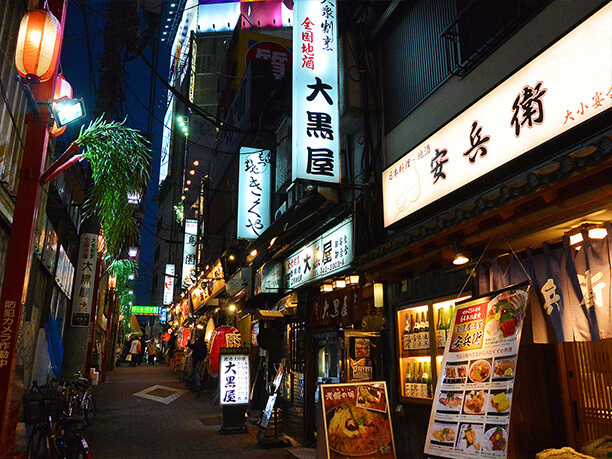 Many of the shops have been around since the Showa era and the nostalgic atmosphere has created another face of Shinjuku. Meet some friendly customers along the Shinjuku Omoide Yokocho! Shinjuku Omoide Yokocho is not a large area. At first the idea of crowding into one of the many small spaces may not seem very appealing. But once you enter you will be greeted by a room full of friendly people who are enjoying themselves in a comfortable atmosphere. It is a great place to make new friends. 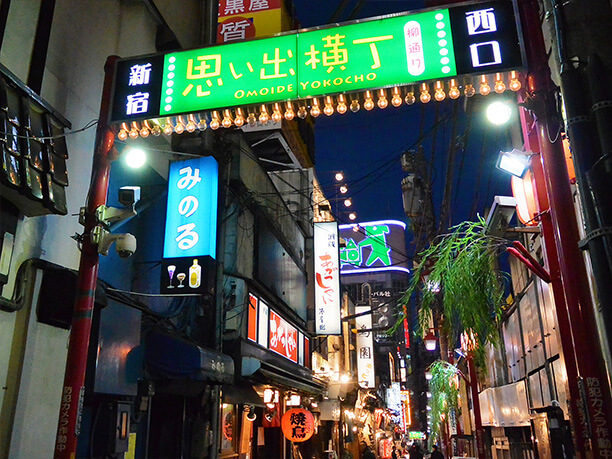 Check out the Yokocho town scroll project! 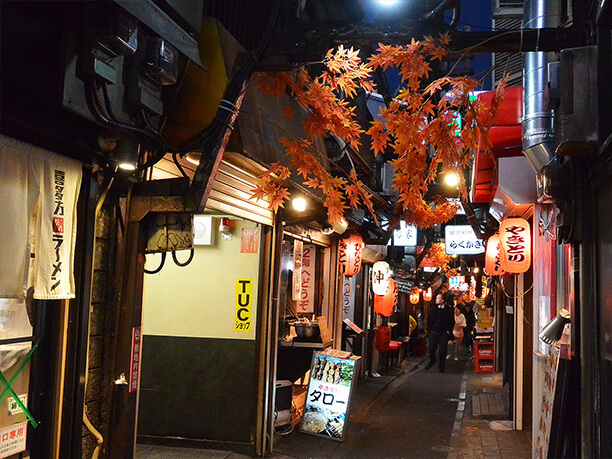 Shinjuku Omoide Yokocho Street has a cultural heritage that includes some interesting art projects and activities. One of the more famous projects is the one led by the Tokyo Polytechnic University students, They are making sketches of scenes around Shinjuku Omoide Yokocho, and joining them together to make a cityscape handscroll produced on a giant curtain. There are also other various activities, such as creating original towel or t-shirt designs and watercolor postcards. These souvenirs postcards are sketches of the area shops and even the shop clerks and they do well to capture the image and atmosphere of Umoide Yokocho (a bit like a souvenir photograph). ◆In the case of using public transportation From the JR Shinjuku Station it is a 5-minute walk. By taxi it is approximately a 10-minute ride and costs 660 to 730 yen. ・From Odakyu line Shinjuku Station it is a 5-minutute walk. By taxi it is approximately a 10-minute ride and costs 660 to 730 yen. ・From the Keio line Shinjuku station it is an 8-minute walk. By taxi it is approximately a 10-minute ride and costs 660 to 730 yen. ・From the Seibu Shinjuku line Seibu Shinjuku station it is a 6-minute walk. By taxi it is approximately a 10-minute ride and costs 660 to 730 yen. ・From the Tokyo Metro Marunouchi line Shinjuku Station it is a 5-minute walk. By taxi it is approximately a 10-minute ride and costs 660 to 730 yen. ・From the Toei Oedo Line Shinjuku Nishiguchi station it is a 2-minute walk. By taxi it is approximately a 10-minute ride and costs 660 to 730 yen.